Here we go again. IBM(s ibm) is once more weighing a sale of its low-end x86 server business, according to the Wall Street Journal. The report (registration required) echoes sentiments seen last April that the IT giant was looking to sell that business to Lenovo — a deal which, obviously, never happened. It’s unclear if Lenovo is in the mix now — Update: Bloomberg subsequently reported that Lenovo is very much in the hunt for IBM’s server business while the Journal noted Dell, now a private company, as a possible buyer. Update: An IBM spokesman said the company does not comment on speculation, IBM could not be reached for comment, but it’s clear that the X86 server business is not the powerhouse it once was and that IBM CEO Virginia “Ginni” Rometty is reshaping the company around cloud computing — the very force that’s shaken up the server market. 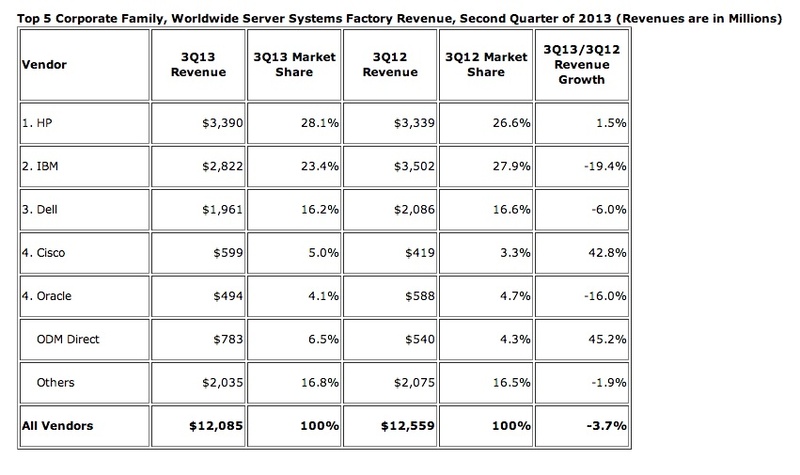 What’s happened in the last few years however is that fewer servers go farther as more workloads get visualized. And, webscale companies increasingly turn to cheaper white box servers for their workloads. Compounding that, as more corporate jobs flow outside to cloud providers — as companies turn to Google Apps or Microsoft Office 365, for example– they don’t need to buy as many servers for internal use. None of that is good news to brand-name hardware makers like IBM, HP(s hpq) or Oracle(s orcl). Intel(s intc), the force behind the X86 architecture, is clearly watching this shift to cloud computing, last week announcing a certification and logo program that extends the successful “Intel Inside” program from the PC and server world, into the cloud realm. IBM, which will release its fourth quarter earnings, January 21, and last week pre-announced plans to invest $1.2 billion in cloud data center expansion. While IBM does not typically break out X86 sales, everyone will now be watching what clarity it will give on its hardware business. Note: This story was updaed at 5:47 a.m. PST January 20 with IBM’s comment and again at 6:49 a.m. PDT January 21 referencing Bloomberg’s report that Lenovo is a strong contender for IBM’s server business. Maybe a good distraction to tomorrows earnings report? Its anyones guess and questioning why/how the news has come out the day before. If this news/rumour is true, not a good sign for x86 in general, and clearly Intel will be further impacted, considering that IBM does about $5BN/yr in revenue and clearly this will disrupt business regardless of who takes it over. Just in hindsight, it took Lenovo 5+ years to turn around the personal PC business it bought from IBM, and I doubt they would have half that time to turn around this business before its dead. Will this be bad news for HP, or even Oracle? I doubt it. Actually, I think HP will probably benefit most during the transition/upheaval. Oracle? Oracle is more and more focused on SPARC and with IBM abandoning Intel, clearly customers will go elsewhere, if they have to buy x86 and/or question whats wrong with Intel? Oracle will benefit regardless and its showing it in the marketshare and company revenue gains. Toshiba and Lenovo are apparently competing for this….